MonarchLIVE kicked off with a broadcast and webcast from Virginia. The program reviewed monarch biology, citizen science programs, and the importance of stewardship and featured former US Forest Service Chief Gail Kimbell and Dr. Karen Oberhauser, a leading monarch butterfly researcher. CLICK HERE to watch the webcast. Over the summer, successive generations of monarch butterflies have been reproducing and slowly moving north. But now, it’s time for the final generation of monarchs to migrate to their overwintering grounds in Mexico (or to California for western monarchs). Monarchs from this migratory generation have an enormous task ahead of them. Weighing less than a gram, these unique butterflies will fly between 2,000 to 3,000 miles to the mountains of Mexico. During the summer breeding season, monarchs live from two to five weeks during which they mate and lay the eggs that become the next generation. The migrating butterflies are different from the earlier generations in two important ways. 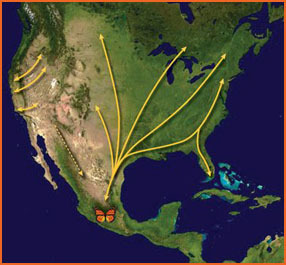 First, they will migrate to the overwintering sites in Mexico or California. Second, they do not reproduce right after they emerge. In response to decreasing temperatures and shortening day lengths at the end of the summer, their reproductive organs remain in an immature state. Instead of mating and laying eggs, they spend their time drinking nectar and clustering together in nighttime roosts in preparation for their long journey south. This delayed maturity is called diapause. Most of these monarchs will remain in this condition until the following spring, when they begin to mate in the overwintering colonies. While the summer monarchs live just a few short weeks, those that migrate can live as long as nine months! While monarchs are not an endangered species, their magical migration is among the most spectacular and unusual of the world’s natural events. Their migration is considered an endangered biological phenonmenon due to threats to the monarach’s habitats during its annual cycle of breeding, migrating, and wintering.